J Judgment Quotient makes sure that children can distinguish right from wrong. 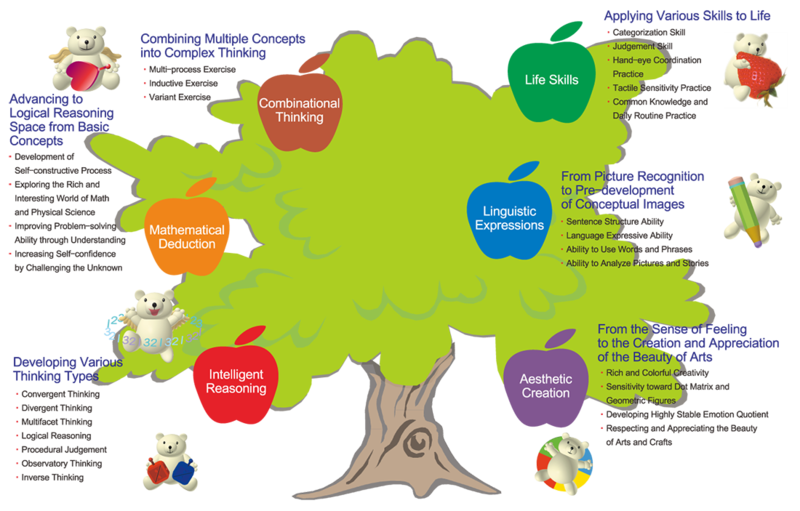 E Emotion Quotient encourages and develops children's positive emotion management. 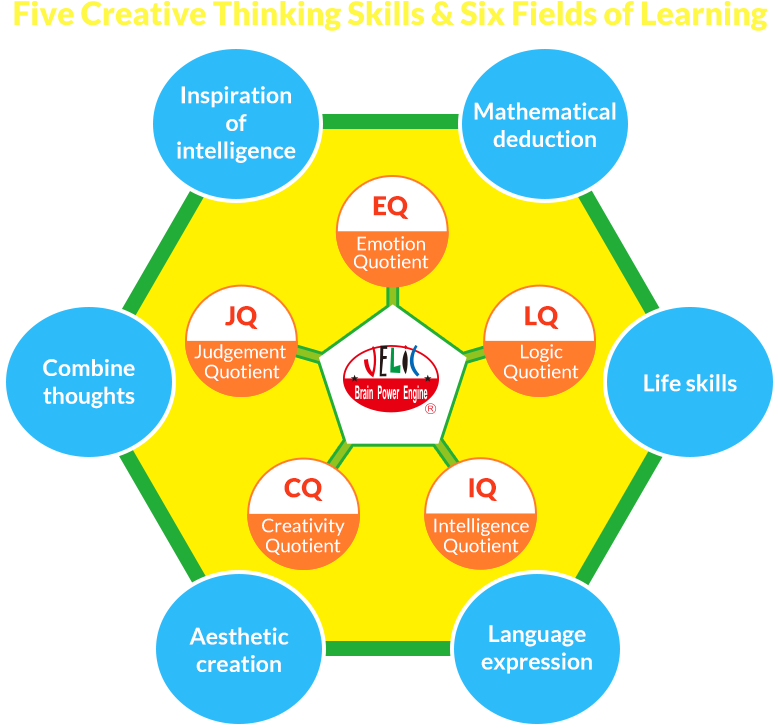 L Logic Quotient trains children's logic thinking. i Intelligence Quotient indicates the intelligence and skills in problem-solving. C Creative Quotient explores the creativity in life. 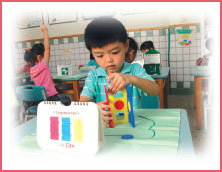 complimentary products are developed to inform parents of their child’s learning progress. During each activity, a student works with materials inside a white translucent Learning Box, labeled with a topic. The box contains operating manuals, learning materials, and an apple-green nylon cloth printed with the JELiC logo and operation charts. Children learn to clean up and arrange the activity materials independently. The green nylon cloth allows children to express their answers within a regulated operating space, and students can learn effectively in a quiet and organized environment. The teacher’s manual is specially designed for instructors to fully understand the content and learning objectives of each box. 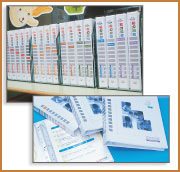 The manual covers instructions for the activity inside the box, and teachers can consult the manual to see whether students are completing the activity appropriately. All students participating in the JELiC development course receive a customized learning progress booklet. 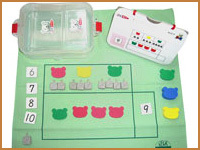 A learning progress table designed by experts in child development for young children allows teachers to record various notes as the student completes the activity. From the worksheet, parents can clearly understand the course content, learning process, student’s progress, and purpose of the operation. Every step is carefully designed and planned. We strive for specialized teaching to support 3 to 6-year-old children in the JELiC program. The purpose of education is not to push children to learn facts, but to cultivate their desire for self-motivated learning. The teacher is just a "guide"
The role of teacher is to observe every student’s progress and individual needs. The best way to help children concentrate is to have them focus their attention on the work they do with their own hands. Systematic curriculum and personalized teaching keeps track of the learning progress. Each child has a different learning approach and need. Specialized materials help support each individual’s learning progress. Children need a quiet and organized environment to learn and develop their interests. Our program emphasizes self-control and progressive learning. Students can build their confidence through the arrange courses that have clearly defined levels of difficulty. They can work with the learning materials closely, with the process stimulating their capability.